Italian war crimes have mainly been associated with Fascist Italy in the Pacification of Libya, the Second Italo-Ethiopian War, and World War II. Italian Fascism, also known as Classical Fascism or simply Fascism, is the original fascist ideology as developed in Italy. The ideology is associated with a series of three political parties led by Benito Mussolini, namely the Fascist Revolutionary Party (PFR) founded in 1915, the succeeding National Fascist Party (PNF) which was renamed at the Third Fascist Congress on 7–10 November 1921 and ruled the Kingdom of Italy from 1922 until 1943 and the Republican Fascist Party that ruled the Italian Social Republic from 1943 to 1945. Italian Fascism is also associated with the post-war Italian Social Movement and subsequent Italian neo-fascist movements. The Pacification of Libya or Second Italo-Senussi War, was a prolonged conflict in Italian Libya between Italian military forces made mainly by colonial troops and indigenous rebels associated with the Senussi Order that lasted from 1923 until 1932, when the principal Senussi leader, Omar Mukhtar, was captured and executed. The Second Italo-Ethiopian War, also referred to as the Second Italo-Abyssinian War, was a colonial war fought from 3 October 1935 until 19 February 1937, although Addis Ababa was captured on 5 May 1936. The war was fought between the armed forces of the Kingdom of Italy and those of the Ethiopian Empire. Ethiopia was defeated, annexed and subjected to military occupation. The Ethiopian Empire became a part of the Italian colony of Italian East Africa. Fighting continued until the Italian defeat in East Africa in 1941, during the East African Campaign of the Second World War. In 1911, Italy went to war with the Ottoman Empire and invaded Ottoman Tripolitania. One of the most notorious incidents during this conflict was the October Tripoli massacre, wherein many civilian inhabitants of the Mechiya oasis were killed over a period of three days as retribution for the execution and mutilation of Italian captives taken in an ambush at nearby Sciara Sciat. 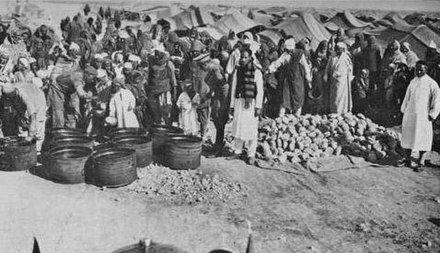 In 1912, 10,000 Turkish and Arab troops were imprisoned in concentration camps in Libya, all Turkish troops were executed. The Italo-Turkish or Turco-Italian War was fought between the Kingdom of Italy and the Ottoman Empire from September 29, 1911, to October 18, 1912. 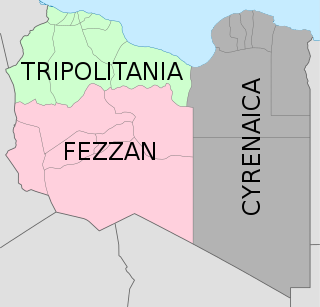 As a result of this conflict, Italy captured the Ottoman Tripolitania Vilayet (province), of which the main sub-provinces (sanjaks) were Fezzan, Cyrenaica, and Tripoli itself. These territories together formed what became known as Italian Libya. The Ottoman Empire, historically known in Western Europe as the Turkish Empire or simply Turkey, was a state that controlled much of Southeast Europe, Western Asia and North Africa between the 14th and early 20th centuries. It was founded at the end of the 13th century in northwestern Anatolia in the town of Söğüt by the Oghuz Turkish tribal leader Osman I. After 1354, the Ottomans crossed into Europe, and with the conquest of the Balkans, the Ottoman beylik was transformed into a transcontinental empire. The Ottomans ended the Byzantine Empire with the 1453 conquest of Constantinople by Mehmed the Conqueror. The coastal region of what is today Libya was ruled by the Ottoman Empire from 1551 to 1864, as the Eyalet of Tripolitania or Bey and Subjects of Tripoli of Barbary from 1864 to 1912 and as the Vilayet of Tripolitania from 1864 to 1912. It was also known as the Kingdom of Tripoli, even though it was not technically a kingdom, but an Ottoman province ruled by pashas (governors). The Karamanli dynasty ruled the province as de facto hereditary monarchs from 1711 to 1835, despite remaining under nominal Ottoman rule and suzerainty from Constantinople. Libyan internees in the El Agheila concentration camp. The Senussi or Sanusi are a Muslim political-religious tariqa and clan in colonial Libya and the Sudan region founded in Mecca in 1837 by the Grand Senussi, the Algerian Muhammad ibn Ali as-Senussi. Senussi was concerned with what he saw as both the decline of Islamic thought and spirituality and the weakening of Muslim political integrity. ʿOmar al-Mukhṭār Muḥammad bin Farḥāṭ al-Manifī, called The Lion of the Desert, known among the colonial Italians as Matari of the Mnifa, was the leader of native resistance in Cyrenaica, currently Eastern Libya under the Senussids, against the Italian colonization of Libya. A teacher-turned-general, Omar was also a prominent figure of the Senussi movement, and he is considered the national hero of Libya and a symbol of resistance in the Arab and Islamic worlds. Beginning in 1911, he organised and, for nearly twenty years, led the Libyan resistance movement against the colonial Italians during the Pacification of Libya. After many attempts, the Italian Armed Forces managed to capture Al-Mukhtar near Solonta and hanged him in 1931. Cyrenaica is the eastern coastal region of Libya. Also known as Pentapolis in antiquity, it formed part of the Roman province of Crete and Cyrenaica, later divided into Libya Pentapolis and Libya Sicca. During the Islamic period, the area came to be known as Barqa, after the city of Barca. Chemical warfare (CW) involves using the toxic properties of chemical substances as weapons. This type of warfare is distinct from nuclear warfare and biological warfare, which together make up NBC, the military acronym for nuclear, biological, and chemical, all of which are considered "weapons of mass destruction" (WMDs). None of these fall under the term conventional weapons which are primarily effective due to their destructive potential. In theory, with proper protective equipment, training, and decontamination measures, the primary effects of chemical weapons can be overcome. In practice, they continue to cause much suffering, as most victims are defenceless civilians. Many nations possess vast stockpiles of weaponized agents in preparation for wartime use. The threat and the perceived threat have become strategic tools in planning both measures and counter-measures. During the 1936–1941 Italian occupation, atrocities also occurred; in the February 1937 Yekatit 12 massacres as many as 30,000 Ethiopians may have been killed and many more imprisoned as a reprisal for the attempted assassination of Viceroy Rodolfo Graziani. A 2017 study estimated that 19,200 were killed - a fifth of the population of Addis Ababa. The Ethiopian Orthodox Tewahedo Church was especially singled out. Thousands of Ethiopians also died in concentration camps such as Danane and Nocra. Yekatit 12 is a date in the Ethiopian calendar, equivalent to 19 February in the Gregorian calendar, which is commonly used to refer to the indiscriminate massacre, known as the Addis Ababa massacre, and imprisonment of Ethiopians by elements of the Italian occupation forces following an attempted assassination of Marshal Rodolfo Graziani, Marchese di Neghelli, Viceroy of Italian East Africa, on 19 February 1937. Marshal Graziani had led the Italian forces to victory over their Ethiopian opponents in the Second Italian invasion of Ethiopia and was supreme governor of Italian East Africa. This was one of the worst atrocities committed by the Italian occupation forces and has been described as the worst massacre in Ethiopian history. Marshal Rodolfo Graziani, 1st Marquis of Neghelli, was a prominent Italian military officer in the Kingdom of Italy's Regio Esercito, primarily noted for his campaigns in Africa before and during World War II. A dedicated fascist, he was a key figure in the Italian military during the reign of Victor Emmanuel III. The Ethiopian Orthodox Tewahedo Church is the largest of the Oriental Orthodox Christian churches. One of the few pre-colonial Christian churches in Sub-Saharan Africa, the Ethiopian Orthodox Tewahedo Church has a membership of between 45 and 50 million people, the majority of whom live in Ethiopia. It is a founding member of the World Council of Churches. The Ethiopian Orthodox Tewahedo Church is in communion with the Coptic Orthodox Church of Alexandria, having gained autocephaly in 1959. 75,000 Italian soldiers of the Corpo Truppe Volontarie fought on the side of the Nationalists during the Spanish Civil War, as did 7,000 men of the Aviazione Legionaria. While they also bombed valid military targets such as the railway infrastructure of Xativa, the Italian air force partook in many bombings of civilian targets for the purposes of "weakening the morale of the Reds". One of the more notable bombings was the Bombing of Barcelona, in which 1,300 civilians were killed, with thousands more being wounded or dehoused. Other cities subjected to terror bombing by the Italians included Durango, Alicante, Granollers, and Guernica. The Corps of Volunteer Troops was a Fascist Italian expeditionary force which was sent to Spain to support the Nationalist forces under General Francisco Franco against the Spanish Republic during the Spanish Civil War, 1936–39. The Legionary Air Force was an expeditionary corps from the Italian Royal Air Force. It was set up in 1936 and sent to provide logistical and tactical support to the Nationalist faction after the Spanish coup of July 1936 marked the onset of the Spanish Civil War. 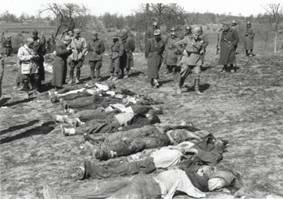 Italian troops walk among the bodies of Greek civilians executed during the Domenikon massacre. This is a working list of Italian high-ranking military personnel or other officials involved in acts of war. It includes also such personnel of lower rank that were accused of grave breaches of the laws of war. Inclusion of a person does not imply that the person was qualified as a war criminal by a court of justice. As noted in the relevant section, very few cases have been brought to court due to diplomatic activities of, notably, the government of the United Kingdom and subsequent general abolition. The criterion for inclusion in the list is existence of reliable documented sources. Alessandro Pirzio Biroli: The Governor of the Italian governorate of Montenegro, he ordered that fifty Montenegrin civilians be executed for every Italian killed, and ten be executed for every Italian wounded. Mario Robotti, Commander of the Italian 11th Division in Slovenia and Croatia, issued an order in line with a directive received from Mussolini in June 1942: "I would not be opposed to all (sic) Slovenes being imprisoned and replaced by Italians. In other words, we should take steps to ensure that political and ethnic frontiers coincide. ",  which qualifies as ethnic cleansing policy. Nicola Bellomo was an Italian general who was tried and found guilty for killing a British prisoner of war and wounding another in 1941. He was one of the few Italians to be executed for war crimes by the Allies, and the only one executed by a British-controlled court. Italo Simonitti, a captain in the Italian Social Republic's 4th Monterosa Alpine division, was executed for his involvement in the 1945 execution of an American prisoner. Pietro Caruso was chief of the Fascist police in Rome while it was occupied by the Germans. He helped organize the Ardeatine massacre in March 1944. After Rome was liberated by the Allies he was tried that September and subsequently executed by the co-belligerent Italian government. Guido Buffarini Guidi was the Minister of the Interior for the Italian Social Republic; shortly after the end of the war in Europe he was found guilty of war crimes and executed by the co-belligerent government. Pietro Koch was head of the Banda Koch, a special task force of the Corpo di Polizia Repubblicana dedicated to hunting down partisans and rounding up deportees. His ruthless extremism was cause for concern even to his fellow fascists, who had him arrested in October 1944. When he came into Allied captivity he was convicted of war crimes and executed. This page is a candidate to be copied to Wikisource. If the page can be edited into an encyclopedic article, rather than merely a copy of the source text, please do so and remove this message. Otherwise, you can help by formatting it per the Wikisource guidelines in preparation for being imported to Wikisource by a Wikisource admin. Note that if this source text is not in English, it will have to be copied using the transwiki process. Sergeant Arthur Banks GC was a member of the Royal Air Force during the Second World War who was tortured and killed after being captured behind enemy lines. He was posthumously awarded the George Cross for his courage during captivity. The 5th Alpini Division Pusteria was a light Infantry division of the Italian Army, specializing in Mountain Combat. The Alpini are a mountain infantry corps of the Italian Army, that distinguished itself in combat during World War I and World War II. The division was formed in 1935. The 6th Alpine Division Alpi Graie was a short-lived light Infantry division of the Italian Army, specializing in Mountain Combat. The Alpini that formed the divisions where from the highly decorated and elite mountain corps of the Italian Army comprising both infantry and artillery units. The divisions name Alpi Graie was chosen as most of its recruits came from the area of the Graian Alps. The 19th Infantry Division Venezia was a mountain infantry division of the Regio Esercito was raised in 1934 to serve in the Second Italo-Ethiopian War under the name Gavinana division. It was demobilized and reduced to the brigade in July, 1936, but again mobilized 15 April 1939, under the "19th Infantry Division Venezia" name. The only difference between line infantry divisions and mountain infantry divisions was that the latter's artillery was carried by pack mules instead of the standard horse-drawn carriages. Italy's real mountain warfare divisions were the six alpine divisions manned by the "Alpini" mountain troops. In October–November 1943, it has gradually get transformed into the partisan Garibaldi division fighting together with Yugoslav Partisans against Axis. The 24th Infantry Division Pinerolo was an infantry division of the Italian Army during World War II. The 36th Infantry Division Forlì was a mountain infantry Division of the Italian Army during World War II. The division was formed as infantry division 31 March 1939, from the men mostly taken from the infantry brigade Monferrato. The men that formed this division were drafted in the Langhe, a geographical region in southern Piedmont. The only difference between line infantry divisions and mountain infantry divisions was that the latter's artillery was carried by pack mules instead of the standard horse-drawn carriages. Italy's real mountain warfare divisions were the six alpine divisions manned by the "Alpini" mountain troops. The 6th Infantry Division Cuneo was an infantry division of the Italian Army during World War II. The Division was formed 24 May 1939 in Milan city, largely from the parts of 58th Infantry Division Legnano. Cuneo division was part of the III Corps, First Army that took part in the Italian invasion of France and the 26th Corps during Greco-Italian War. The 12th Infantry Division Sassari was an Infantry Division of the Italian Army during World War II. After the end of World War I the Italian Army disbanded all brigades raised during the war with the exception of the Sassari Infantry Brigade and three further brigades, which also had distinguished themselves during the war: Liguria, Arezzo and Avellino. The brigade moved to Trieste as part of the 12th Infantry Division Timavo'. In 1926 the brigade gained the 12th Infantry Regiment Casale and changed its name to XII Infantry Brigade. Along with the 34th Artillery Regiment the brigade were the only units of the 12th Division. In 1939 the brigade lost the 12th Infantry regiment and was renamed 12th Infantry Division Sassari. This binary division consisted of only two infantry regiments and the 34th Field Artillery Regiment. To increase the weak strength of the division in 1941 the division was joined by the 73rd Blackshirt Assault Legion Boiardo, a battalion sized militia unit of the Italian Fascist Party. The 14th Infantry Division Isonzo was an infantry division of the Italian Army during World War II. The division was formed 24 May 1939. It surrendered to German forces on 11 September 1943. The 15th Infantry Division Bergamo was an infantry division of the Italian Army during World War II. It was formed 24 May 1939 in Opatija. The 18th Infantry Division Messina was an infantry division of the Italian Army during World War II. It was formed 24 May 1939 in the Fano area on the Italian Adriatic sea coast and was dissolved by Germans 13 September 1943 in Croatia. The 21st Infantry Division Granatieri di Sardegna was an infantry division of the Italian Army during World War II. The Granatieri di Sardegna Division can trace its origins to 1659 when the Duke Carlo Emanuele II of Savoy formed a regiment of Guards. It became a unit in the national army in 1866. The 22nd Infantry Division Cacciatori delle Alpi was an infantry division of the Italian Army during World War II. The Cacciatori delle Alpi was mobilized for war in June 1939 and was dissolved 11 September 1943. The 23rd Infantry Division Ferrara was a mountain infantry division of the Italian Army during World War II. It was formed as division Murgia 28 March 1939. The name was changed to Ferrara 24 May 1939. The only difference between line infantry divisions and mountain infantry divisions was that the latter's artillery was carried by pack mules instead of the standard horse-drawn carriages. Italy's real mountain warfare divisions were the six alpine divisions manned by the "Alpini" mountain troops. After the Italian surrender to the Allies in September 1943, the Division surrendered to the Germans. Its men were drafted in Bari and in the Murge. The 32nd Infantry Division Marche was a mountain infantry division of the Italian Army during World War II. It was formed 22 February 1939 in Conegliano as Division 32a Marche, based on earlier infantry brigade Marche. The only difference between line infantry divisions and mountain infantry divisions was that the latter's artillery was carried by pack mules instead of the standard horse-drawn carriages. Italy's real mountain warfare divisions were the six alpine divisions manned by the "Alpini" mountain troops. The 48th Infantry Division Taro was an infantry division of the Italian Army during World War II. It was formed on 12 September 1939 in Catanzaro and ceased to function 8 September 1943 in Toulon. The 158th Infantry Division Zara was a regular infantry division of the Italian Army during World War II. The Zara Division formed in March 1942, was a garrison division stationed on the Dalmatian coast. It surrendered to the Germans after the Italian surrender to the Allies in September 1943. The 57th Infantry Division Lombardia was a regular infantry division of the Italian Army during World War II. It was formed on 24 May 1939 in Pula and disbanded on 8 September 1943. The 154th Infantry Division Murge was an infantry division of the Italian Army during World War II. The Murge Division was a garrison division formed in April 1942. It was sent to Dalmatia as an occupation force and took part in anti-Partisan operations. It took part in the Battle of the Sutjeska and then had to be withdrawn after suffering heavy losses in fighting with the Partisans. It was disbanded in September 1943, following the Italian surrender to the Allies. ↑ Duggan, Christopher (2007). The Force of Destiny: A History of Italy Since 1796. New York: Houghton Mifflin. pp. 496–497. ↑ Mann, Michael (2006). The Dark Side of Democracy: Explaining Ethnic Cleansing. Cambridge University Press. p. 309. ISBN 9780521538541. ↑ Ahmida, Ali Abdullatif (23 March 2011). Making of Modern Libya, The: State Formation, Colonization, and Resistance, Second Edition. SUNY Press. p. 146. ISBN 9781438428932. ↑ Barker, A. J. (1968). The Civilising Mission: The Italo-Ethiopian War 1935–6. London: Cassell. ISBN 978-0-304-93201-6. Pages 292-293. ↑ 1931-2017., Thomas, Hugh, (2003). The Spanish Civil War (4th ed.). London: Penguin. ISBN 9780141011615. OCLC 53806663. ↑ Conti, Davide (2011). "Criminali di guerra Italiani". Odradek Edizioni. Retrieved 2012-10-14. ↑ Rudolph J. Rummel. "Statistics of Democide: Genocide and Mass Murder Since 1900." LIT Verlag, 1998. Page 168. ↑ Constantine A. Doxiadis, "Destruction of Towns and Villages in Greece." Series of Publications of the Ministry of Reconstruction, no.11 (Athens: Ministry of Reconstruction, 1947), p.59. The 112 GRD/USD conversion can be worked out from p.63. ↑ Baranowski, Shelley (2010). Nazi empire : German colonialism and imperialism from Bismarck to Hitler. Cambridge: Cambridge University Press. p. 273. ISBN 978-0-521-67408-9. ↑ Margherita, Marchione. "Pope Pius XII: Architect for Peace." Paulist Pr, May 2000. Page 280. ↑ Alessandra Kersevan 2008: (Editor) Foibe – Revisionismo di stato e amnesie della repubblica. Kappa Vu. Udine. ↑ Giuseppe Piemontese (1946).Twenty-nine months of Italian occupation of the Province of Ljubljana, page 10. ↑ Gianni, Oliva (2007) "Si ammazza troppo poco". I crimini di guerra italiani 1940–1943, Mondadori. ↑ Tommaso Di Francesco, Giacomo Scotti (1999) Sixty years of ethnic cleansing, Le Monde Diplomatique, May Issue. Alessandra Kersevan 2008: (Editor) Foibe – Revisionismo di stato e amnesie della repubblica. Kappa Vu. Udine.